With a single individualized infrared system, several drying and sintering processes can be implemented. Printed electronics and functional printing are on a rise, be it as RFID (radio frequency identification), as a part of phone or credit cards (smart cards), or in the form of copy protection or security in passports. 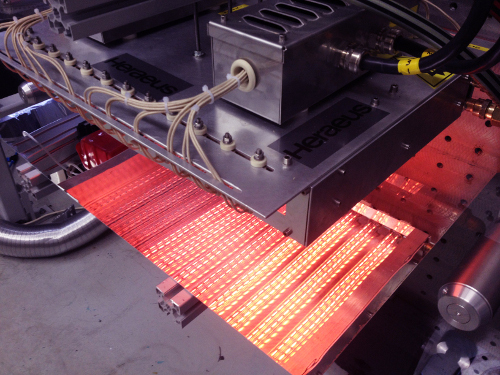 Heraeus Noblelight has announced a new infrared-system, which enables several different drying and sintering processes. In the production process of printed electronics, organic inks or inks including metal are applied to plastic foil, paper, or glass. By drying, sintering, or curing, the desired conductive properties are achieved. UV-lights or LEDs, flashbulbs, furnaces, or infrared-systems are used for these purposes. However, manufacturers need to switch modules or install different modules to include different inks or materials in the production process. This effort is meant to be minimized by the new infrared system by Heraeus. With the help of a invidiualized system, several different drying and sintering processes can be implemented. There are two possible variations. The first variation is a infrared module that is equipped with only one UV tube – the possibility for different applications is ensured by an intelligent control unit. The second variation brings several possible installs of drying and sintering zones inside a single infrared module, by enabling the respective heat zones to be equipped with different tube types. Both variations provide infrared power densities from 20 to 220 kW/m2. Through filament temperatures of 1,200 to 3,000 °C, the spectrum can be adapted to the reflective and absorbing properties of ink and substrate. During tests, recorded speeds went up to 60 meters per minute. With both variations, changing tubes, modules or other components while changing the process is no longer a necessity. This is meant to increase the systems productivity.